Trial Xtreme – Xtreme-ly fun to play? Trial Xtreme may be reminiscent of Motorcross Madness, but it’s not quite the same, to my chagrin, even if the gameplay is quite similar: you have to perform a number of stunts in order to overcome obstacles. 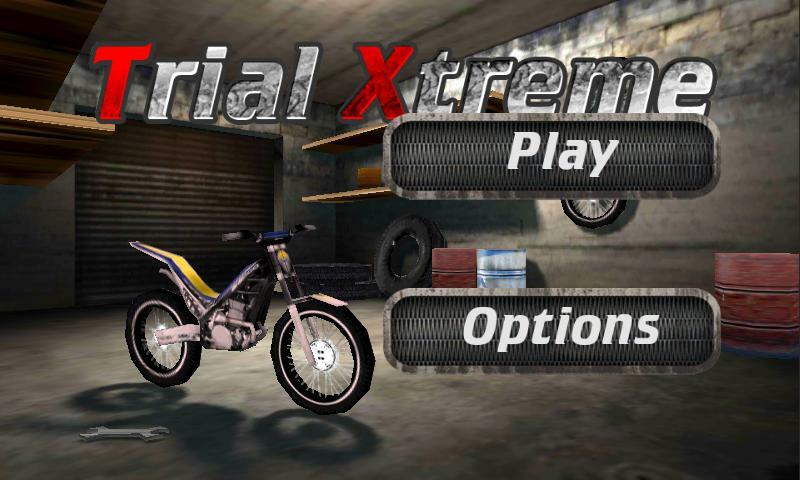 Trial Xtreme’s main menu harbours three different options: you can start a game, check out the high scores or change the game settings. Hit ‘Play’ and you can choose between two packs which harbour 60 levels. The gameplay is classic: the goal is quite simply to make it to the finish line safe and sound. And while doing so is relatively simple in the beginning it becomes more challenging as you progress to higher levels. There are more obstacles, more ramps, more logs and fallen trees, more containers to contend with. There are four controls options that can be used to overcome obstacles and hurdles: step on it (i.e. accelerate), use your brakes, tip forwards and tip backwards. If you stick to the standard settings you will be able to tip the motorcycle by tipping your Android device. You can change to using buttons instead. Every time you successfully complete a level you will be able to see your score as well as the time it took you to finish and the speed you were going at. If you have an OpenFeint account you will also find all your entries there. The game doesn’t have an achievements section but you can check out your high scores—theoretically at least, because the high scores were all higgeldy piggeldy every time I tried to check them. I can’t say whether this is due to the game itself or OpenFeint. Another small bone of contention: the sound effects volume was a bit naff. Sound effects are really loud whereas the engine noise and (really nice) background music are quite low. Here’s hoping this small glitch will get sorted out quickly! 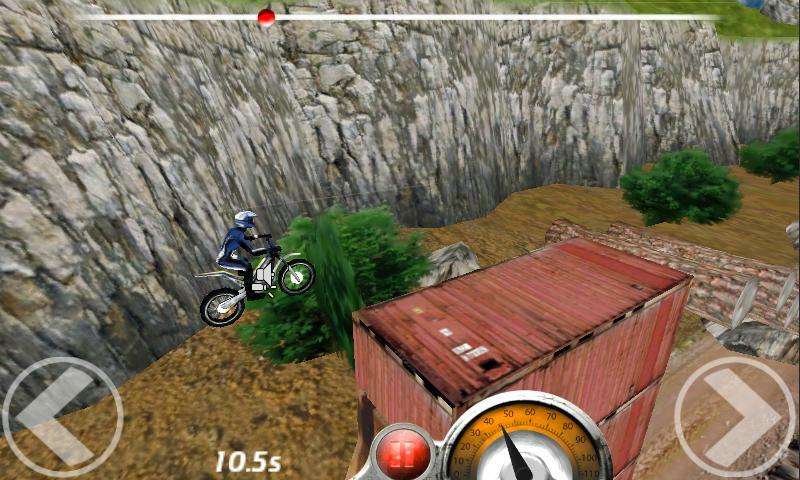 Trial Xtreme is the type of arcade game that’s good fun to play when you have a bit of time to kill. It’s challenging enough to keep you interested and it runs pretty well – aside from the OpenFeint integration and volume issues – and is fun to play. There are a lot of different types of obstacles so it doesn’t become boring all too quickly. 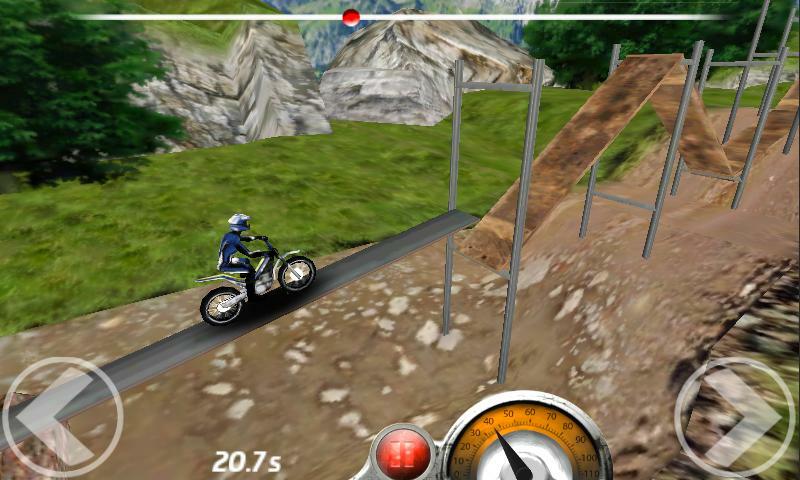 The Trial Xtreme controls are good and can be adapted to suit a player’s personal preferences. I prefer using onscreen buttons, but to each her own, as we know. The Trial Xtreme graphics don’t blow my mind, but they are perfectly nice and very well done and the whole game is 3D, including the obstacles. Trial Xtreme took no time to load on the LG Optimus Speed / 2x. Another good thing is that it doesn’t lag or crash at all. Trial Xtreme can be purchased for an absolutely democratic price of EUR1,41. There’s also a free trial version.